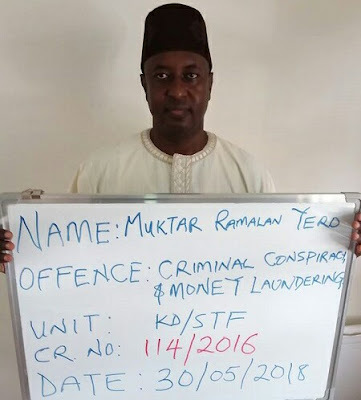 The Economic and Financial Crimes Commission, EFCC Kaduna office, on Thursday May 31, 2018 arraigned the former Governor of Kaduna State, Ramalan Yero; former Minister of State, Nuhu Somo Wya; former PDP Kaduna State Chairman, Abubakar Haruna Gaya and the former Secretary to the State Government, Hamza Ishaq. They were arraigned before Justice S.M. Shuaibu of the Federal High Court Kaduna on a Four Count charge bordering on Criminal Conspiracy, Bribery, Money Laundering and Criminal Diversion to the tune of N7000,000,000 (Seven Hundred Million Naira). They all pleaded not guilty to the charges. Lead prosecution counsel, Joshua Saidi then prayed the Court for a date for commencement of trial, while remanding the accused persons in prison custody. Lead defence counsel, Yunus Ustaz Usman (SAN) made application for bail orally but Justice Shuaibu refused. The Court ruled that formal applications for bail of the accused must be filed. He therefore adjourned the matter to the 6th of June, 2018 for hearing of bail application. He also ruled that the former Governor and others be remanded in prison. Their arraignment followed a petition alleging criminal diversion of One Hundred and Fifteen Million Dollars equivalent to Twenty Three Billion, Two Hundred and Ninety Nine Million, Seven Hundred and Five Thousand Naira (N 23, 299,705,000.00) NNPC missing funds some years ago by the former Minister of Petroleum Resources Mrs Diezani Alison Madueke. The missing sum was later traced to have funded the bribing of officials across the 36 state of the federation for the 2015 presidential election through Fidelity Bank. Investigations into the case has so far revealed that the over Twenty Billion Naira was wired to some top PDP and INEC officials across the country which was specifically disbursed through various branches of the Fidelity Bank with Kaduna State benefitting over N800 million (Eight Hundred Million Naira) only in two instalments of N700,000,000 and N190,000,000. The sum was received and acknowledged by Nuhu Somo Waya, Abubakar Gaya Haruna and Hamza Ishaq on behalf of the State for onward sharing to INEC staff spread across the 23 Local Government Areas in Kaduna State. Count one of the charge reads: "that you, Mukhtar Ramalan Yero (Whilst being the Executive Governor of Kaduna State ), Nuhu Somo Wya (Whilst being a former Minister of the Fedearl Republic of Nigeria), Ishaq Hamza (whilst being the Secretary to the Kaduna State Government) and Abubakar Gaya Haruna (Whilst being the Chairman PDP Kaduna State Chapter), sometime in 2015 in Kaduna within the jurisdiction of this Honourable Court (Federal High Court) did conspire amongst yourselves to commit a crime to wit: indirectly taking possession of the of N700, 000, 000 (seven hundred million Naira) which you ought to have known forms part of unlawful activity to wit: bribery and thereby committed an offence contrary to Section 18(a)of the Money Laundering (Prohibition) Act 2011 (as amended) in 2012 and punishable under Section 15(3) of the Same Act."